Kudla girl is on a role! She straddles both the small and silver screen with confidence. Now, her sights are set on a new Tamil serial. After being part of the royal experience on Kannada television with the hit saga Aramane, she impressed the audience with her beautiful role in Ondu Motteya Kathe and then followed it up with Katheyondu Shuruvaagide. In between, she did a brief appearance on the small screen with the multilingual mega venture Nandini. 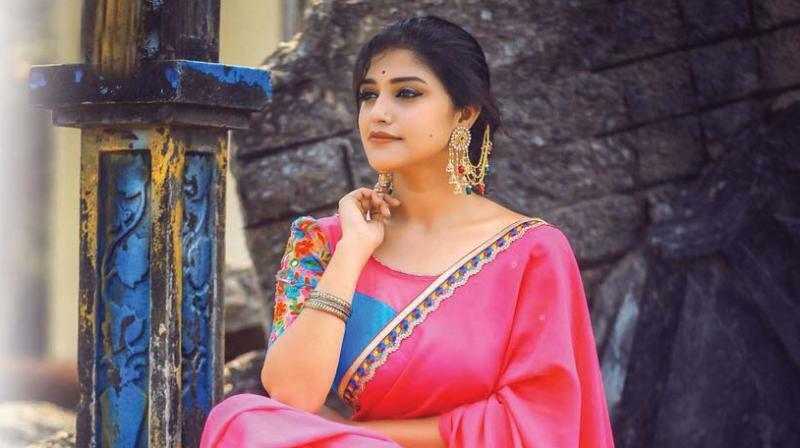 Actress Shreya Anchan who is basking on her success on both the small and silver screen, is travelling to Kollywood to shine in a brand new tele-serial Thirumanam which translates to “married” on Colors Tamil. The serial is the remake of Kannada’s most popular tale Agnisakshi. The Mangaluru hudugi speaks to Bengaluru Chronicle about her recent successes, and her latest TV venture in the neighbouring state. “While I was doing movies, I was a part of the popular serial Nandini which is being made in other languages, including Kannada. I balanced both television and movies even though there was a lot of difference in the work. My mother tongue is Tulu, and my native language is Kannada. Tamil is new to me, but as an artist, there is no escaping the fact that I have to learn and understand it. I am in the process of learning Tamil. Working for the serial which is the remake of the Kannada serial Agnisakshi has been great so far,” says Shreya Anchan. Unlike many actors who do not wish to return to the small screen after finding a foothold in the film industry, Shreya who has has been a part of two back-to-back successful movies, explains that portraying a well-rounded character is the more important than taking up any lead role in a movie. “I have been getting several offers as a heroine in films but I wish to take up only roles which appeal to me as an artiste, and also to the audience. For instance, though my role in Ondu Motteya Kathe was shorter, it had a greater impact on the audience’s mind and that earned me appreciation as well as recognition. So is the case with Katheyondu Shuruvaagide which was again a different tale from the regular genre of movies,” she says, adding that she would much rather play sensible character roles than glam lead ones that have little relevance. About carrying on with her work on the small screen, she shares that despite differences in the two mediums, work remains the same, and at the end of the day, it is about pleasing the audience. “A serial involves working for more than a year, but cinema is a different ball game, where each and every minute detail is worked carefully before the film is wrapped up in three to four months. Right now, I am concentrating on a Tamil serial and would like to take up something interesting if it comes up,” Shreya wraps up adding that all the juggling between Mangaluru, Bengaluru and Chennai has kept her busy, and she has been managing to dance only during her leisure time. The Tamil serial is set to air from October 8, and we wish the kudla girl all the best for it.